The sound of the $293,200 911 GT2 RS is like nothing in the current Porsche lineup – or on the road right now, period. 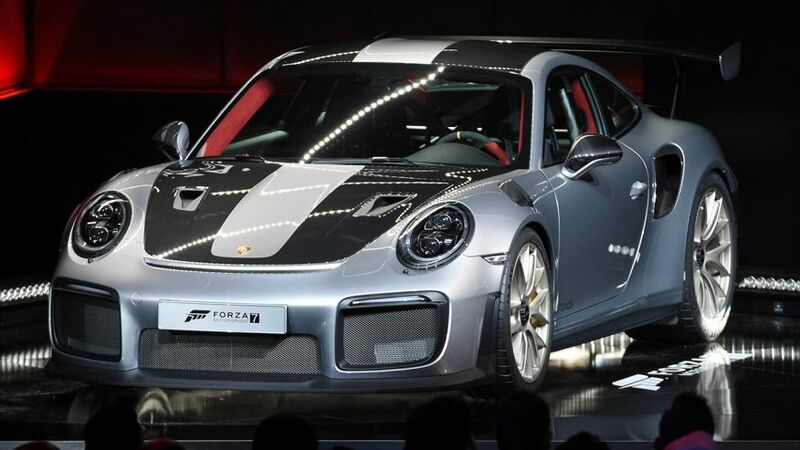 Hammer the floor-mounted accelerator pedal and the GT2 RS spits raw, melodious frequencies that will rumble your spine and make your hair stand on end. “We wanted to make an honest turbo,” Porsche’s Andreas Preuninger, who’s in charge of Porsche high-performance GT range of cars like the 911 GT3 and Cayman GT4, says, “because nowadays turbos tend to get modified in a way that they feel like 10-liter [naturally aspirated] engines, and that’s not the point.” Preuninger’s voice speeds up, like a whirring compressor. Porsche has jacked the GT2 RS’s output to 700 horsepower and 553 lb-ft of torque, a considerable leap over the Turbo S’s 580 horsepower. The Turbo S-derived variable geometry twin turbochargers now feature larger turbines and compressors, enabling the 3.8-liter flat six to spin to 7,200 rpm. Upgraded bits include the crankcase and pistons, while a multitube air filter sees its first use in a production car, incorporating five tubes for increased cooling surface area. The ignition key turns with your left hand, a tradition Porsche has adhered to despite the ubiquity of engine start/stop buttons, and the flat six growls to life through a titanium muffler. Since the RS is always in track mode, Porsche drops the familiar manettino-style dial from the wheel. The only powertrain settings on this rear-drive monster are PDK Sport, stability control off, and stability and traction control off. If you’re into even growlier sounds, a sport exhaust button frees further decibels via a tailpipe flap. While the modified 7-speed dual-clutch transmission shifts quickly and is smooth enough in regular or PDK Sport mode for everyday use. Though you might have the itch to tap the small steering wheel-mounted paddle shifters, in automatic mode the PDK shifts intuitively enough to obviate the need to swap cogs manually. The only two times I found it more satisfying to shift manually was during a brief downpour when I preferred being in full control of torque delivery, and when I wanted to appease gesticulating locals with the dramatic sounds of the crackling, wailing exhaust. Incidentally, my big-winged, hornet-liveried tester drew just as much visible awe from the Portuguese as did Lamborghinis and McLarens I’ve tested there in the past. But that’s not remotely damning for this latest, greatest track toy—in fact, it’s exactly the kind of car Porsche needs, since this is represents the performance pinnacle of their 22-car 911 lineup. If the stripped-down T isn’t supercar enough, or if the Turbo S is simply too refined and smoothed out, the GT2 RS is just nasty enough to satisfy your thrillseeking side. And that nearly $300,000 price tag? Complain not, my friend; Porsche will only build around 2,500 GT2 RSs, and the demand has already far exceeded the supply.